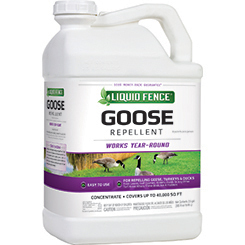 The application of Liquid Fence® Goose Repellent (Concentrate) makes the food supply in the application area very undesirable to geese, turkeys and ducks. The elimination of the food source will change the feeding habits of these birds and cause them to look for a more desirable feeding location. Add 16 fl oz of product for each gallon of water and thoroughly mix. Note: Intended for turf use only. Not intended for use on ornamentals. PESTICIDE STORAGE: Store in original container, in a cool, dry area inaccessible to children and pets. Protect from heat and freezing. Store between 40°F and 90°F. Keep container closed tightly to prevent evaporation. If spillage occurs, dilute with water and flush away. 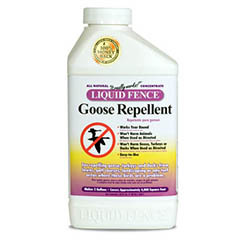 PESTICIDE DISPOSAL: If empty: Nonrefillable container. Do not reuse or refill this container. Place in trash or offer for recycling if available. If partly filled: Call your local solid waste agency for disposal instructions. Never place unused product down any indoor or outdoor drain. CAUTION. Causes moderate eye irritation. Avoid contact with eyes, skin or clothing. Harmful if swallowed. Wash thoroughly with soap and water after handling and before eating, drinking, chewing gum or using tobacco. Remove and wash contaminated clothing before reuse. Prolonged or frequently repeated skin contact may cause allergic reactions in some individuals. Users should wear protective eyewear (e.g. goggles or face shield), waterproof gloves and protective clothing: long-sleeved shirt, pants, shoes and socks. Have the person sip a glass of water if able to swallow. Have the product container or label with you when calling a Poison Control Center, doctor, or going for treatment. You may also contact 1-800-923-3623 for emergency medical treatment advice.